Friends of Chatham Traction were at Chatham Historic Dockyard's Salute to the 40s Weekend again on 16th-17th September. As last year, some interesting, and interested, people dropped by and we made a few more contacts, one from Australia. The display of descriptive panels showing what we're about had been re-jigged and improved another step. We were also a bit happier with our display of wares. The Dockyard destination shown is a mounted print of an actual Chatham Traction destination blind. We're wondering if this idea could be developed into a product range of gifts or mementos for exiled Medway folk or anyone looking for something different. Anyone fancy the Wagon-At-Hale or Burma Way? Borstal, even...? Comments welcome! The first and last of the six panels describing the Medway Heritage Bus Project. Mention should be made of the other one-time Luton Depot bus with Dockyard associations. Former Maidstone & District Atlantean 558 LKP has been at the Dockyard for some years, and after some concerted effort by Peter Watson, his family and a few volunteers is now really coming together. Nice one guys! Some great work by South East Coachworks' team of young Coachbuilders is producing impressions of what's to come. 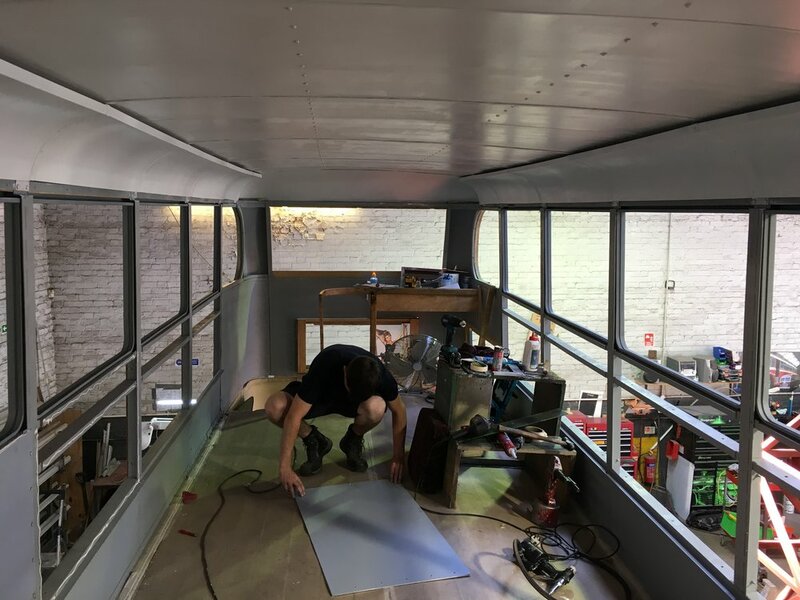 The first section of recreated skirt flare at the rear, ventilation baffles in the upper deck roof, a complete new stairs unit and the curved plywood screen at the rear of the upper deck are all exciting steps towards the end product. Wednesday 16th September saw a major milestone in the restoration of GKE 68, with the return of the bus to Nu-Venture's Aylesford garage sporting a complete, rebuilt body structure. GKE 68 arrives back at Aylesford. 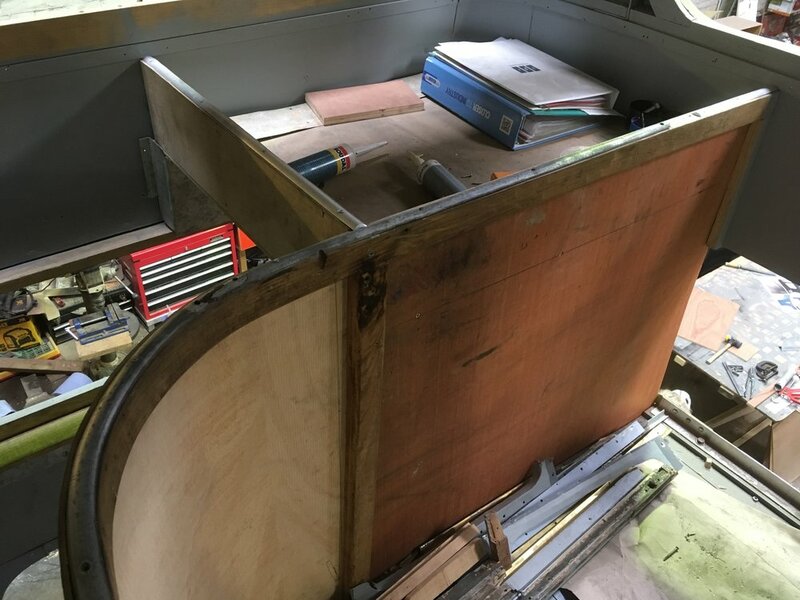 The last stages of the bus's 22-month rebuild on the Romney Marsh were somewhat extended, but an extra effort over the final 4 weeks saw the two decks reunited following completion of the roof rebuild. The bus now has a sound structural body as a result of a thorough exercise to address all structural components. This was always going to be the biggest single task and its completion provides a solid basis for the balance of the restoration. To draw local attention to this achievement we're planning to display the bus for a day in Chatham in a few weeks' time. Sadly, we heard last week that Brian had died, on Saturday 1st November. He was 81. He was a life-long bus enthusiast, having started to visit Luton depot regularly whilst still at school. He joined Chatham Traction as a Conductor in 1955 on completion of his National Service, a job he did with Maidstone & District until the end of crew buses in the late 1970s. Brian bought GKE 68 in December 1960 for £65, one of the earliest moves in the country to privately preserve a bus. He came along to the very earliest meetings of the group that evolved into the Friends of Chatham Traction, and made a whole-hearted contribution to the 2005 Commemorative Event by bringing many of his treasured artefacts to show and turning out for the day in full Conductor's rig. He provided many observations and memories of life on the buses in the 50s, but his shining contribution to our cause was, uncharacteristically perhaps, a starring role when we were featured by BBC South East Today in November 2008. We invited him to become our Honorary Life President two years later, which he accepted. 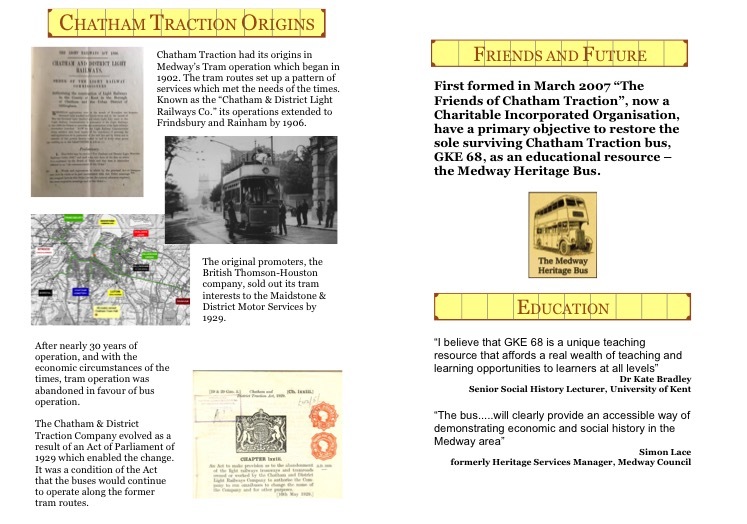 By all reports, buses were Brian's life and for "his" bus to come back and tell the story of Chatham Traction's contribution to life in Medway would be a fitting tribute. 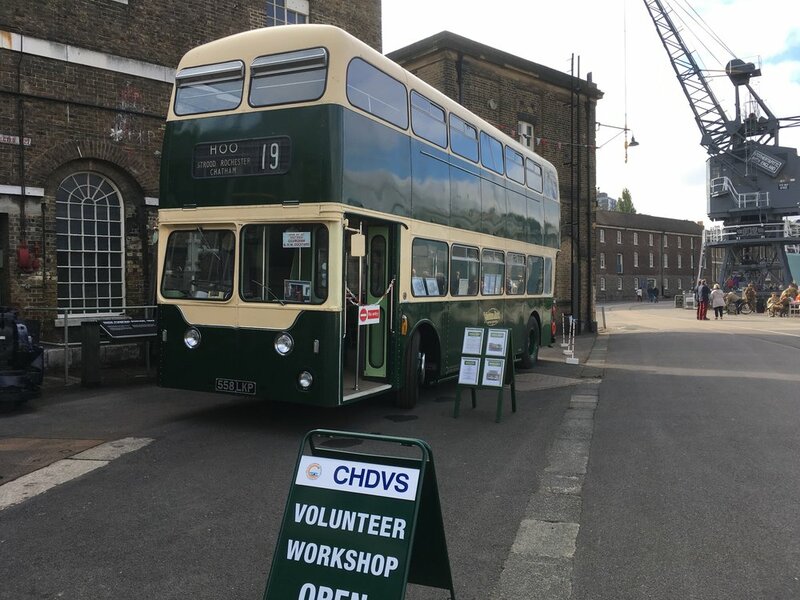 On the last day of September we received the news that our Medway Heritage Bus had been selected for a shortlist of 30 applications to the Yorkshire Building Society's Lasting Legacy Fund. Of these, 15 projects will receive £10,000, the winners being chosen by a public on-line vote. Please have a go on our behalf - it only takes a couple of minutes. The details are on the YBS website at http://www.ybs.co.uk/legacy/index.html. And tell your family, friends, colleagues, club members, anyone.....! Voting closes on 31st October. In August we launched a further fund-raising initiative called 75@75 in acknowledgement of GKE 68's 75th birthday and an estimate that £75,000 would see us a long way towards completing its restoration. We've contacted a number of Medway companies, businesses and individuals to raise awareness and seek support with some promising responses. The appeal was launched at Chatham's new Waterfront Bus Station in the company of Medway Councillor Howard Doe, whose portfolio includes Heritage. Five Trustees and a Councillor. The poster being held by Wendy will start to appear around the Towns soon. During June GKE's lower deck started to look like the real thing again. Timber decking was added to the platform, and all the stress panels were fitted in place. New platform decking. The used ticket box and rear saloon panel are original. The stairs handrail has long been bent probably as a result of a rear-end shunt at some point in the bus's itinerant life around the farmyards of Britain. It'll recover... Anyone know where to find metal platform edging angle with the non-slip texture? No yellow edges in 1939. Stress panels fitted, and floorboards cut and laid but not yet fixed pending work on the chassis components which is still to begin. The front partition is the original, apart from the pillars at each end, as is the ceiling support structure. Activity on the project is generally moving up a gear and we felt we needed to be able to both report new events and update our website quickly. A move to Squarespace has made this possible and has prompted a re-hash of the site. Much of the material is from our original site, re-presented in what we hope is a clear and easy to read format. Our thanks to Nic Brokenshire and Footprint Computers for getting us this far.